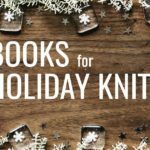 Last week, I found myself scrambling for a last-minute knitting project before heading into a full day of meetings. After rummaging through the bin of free yarn and some odds and ends in my desk drawer, I came up with a ball of Lorna’s Laces Shepherd Sport in waistcoat, leftover from the Steampunk Pullover in Knitting Traditions 2017. It was just enough to make a pair of socks. (Have I mentioned that I love knitting socks?) Socks are perfect for knitting in meetings: I’ve knit enough pairs that I don’t need to swatch, and they’re easy to tote from conference room to conference room. Maybe sock-weight sweaters aren’t all bad. I grabbed a pair of needles and scrolled through our catalog of socks patterns. What kind of sock knitting was I in the mood for? Vanilla socks? (Meh; plain socks in solid yarn are no fun to make or wear.) Cabled socks? (Nope; I think cables are fussy.) Lace socks? (Not this time; I’m just not feeling lacy right now.) I needed something that was interesting enough to show off the yarn, but not so busy that I needed to focus on it. It’s a tricky combination! I finally decided on the Passerine Socks from Sockupied. 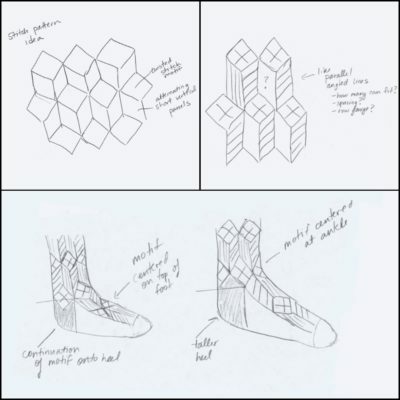 Cookie A is a sock wizard, and I’ve always loved her patterns; Sock Innovation was one of the first sock knitting books I books I ever bought, and I still use it both as a reference and for the fabulous sock patterns. Her patterns are fun, with bold, geometric patterns; while some of her patterns do use yarnovers, you definitely wouldn’t describe them as lacy! 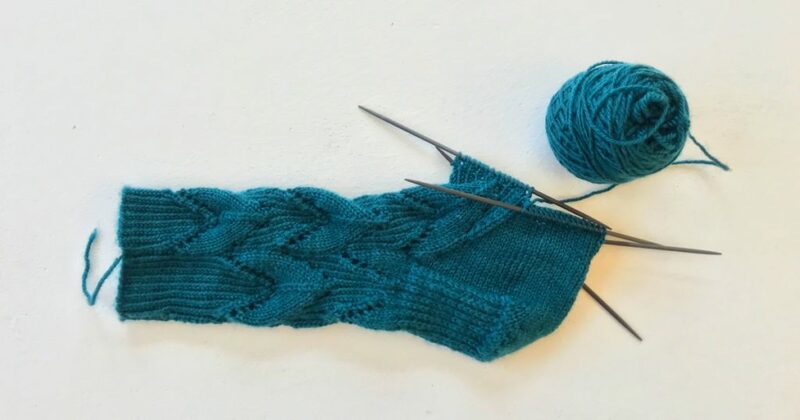 One of the things that makes Cookie’s sock patterns so brilliant is she uses stitch patterns that are easily divided onto four double-pointed needles. You don’t have to shift the stitches around to keep the pattern aligned. It’s a clever design detail that makes knitting socks with a fancy stitch pattern more enjoyable. 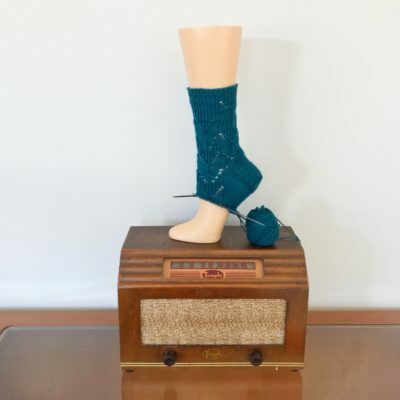 Knitting socks is its own major award. Armed with my new sock knitting project, I made it through all of the meetings without falling asleep or driving my coworkers crazy with my incessant fidgeting. I’m almost all the way through the gusset on my sock! With any luck (and a few more meetings), I’ll be finished in no time. What kind of socks do you prefer?